We had some very interesting finds. 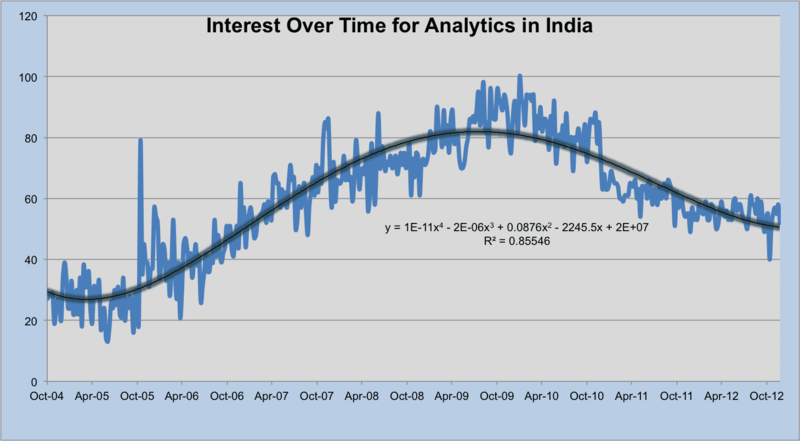 The search activity for the term ‘Analytics’ in India was at its peak at around end 2009 – Beg 2010, post which the activity started to cool off. We don’t see any apparent reasons for this. Essentially, the activity around analytics in India is still strong and infact heating up. It would not be apt to correlate the real market activity with search activity. Gurgaon tops among the major cities in India, which originated search activities on analytics. It was followed by Noida, Bangalore and Hyderabad. This again is contrary to the real market activity. From our research, Bangalore tops the Indian cities with most activity on Analytics, followed by Gurgaon and Mumbai. Even with relative dip in search activity from India, it remains substantially higher than in US. 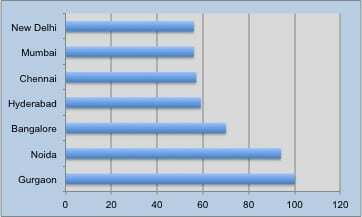 The average normalized (0-100) search rating from India is 61 vs 32 for US. We then thought of looking for analytics in India on the newly launched Correlate from Google. Google Correlate (http://www.google.com/trends/correlate) enables you to find queries with a similar pattern to a target data series. In other words: it does what Google Trends does, but in reverse. For most of the terms here, the correlation with ‘Analytics’ doesn’t make much of a sense. May be a result of spurious, coincidental correlation in search activity.